At Jewelry by Michelle, each piece of jewelry is hand crafted and designed for each individual specific to their request. They have a number of unique pieces and if you are not sure what to purchase, gift certificates are always available in any amount. These also make a wonderful gift for that special person in your life. They make their jewelry in many different styles. There are mixed metals, gold, silver, and copper used in each piece depending on what the customer has requested. Many of their designs are one of a kind. They have many different pieces you can choose. The earrings are intricately designed. The gold and silver wrap earrings are made by rolling gold and silver tight. The Dusters are quite long and very pretty. Lanterns have a long stone in them that has a bright hue. 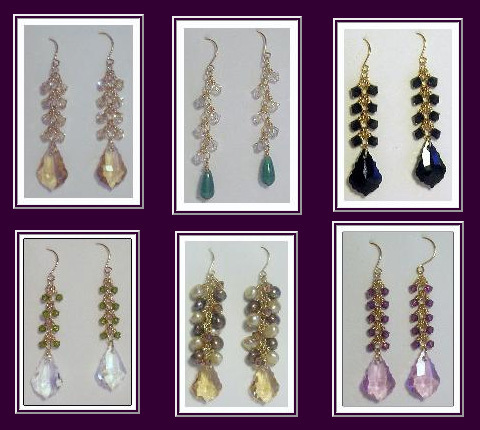 Palmetto earrings are made from many different stones and colors. Triangle earrings can be quite glossy or quite plain, but whatever you choose, they will be quite elegant. The pearl and swirl set is quite handsome. With their huge swirls and two smaller pearls, these are sure to be a hit. They do have curved earrings that have many colors or one color on them. The Trillium Garnet earrings have a garnet in the middle of a heart. The necklaces and pendants come in a whole array of vibrant colors. Some are triple layer, double, or single pieces. Most are made up with the other pieces in mind such as the wraps, dusters, pearl and swirls, and triangle shaped pieces. There is a pearl and swirl necklace that is just twice the size of the earrings. There is also a swirl pendant, a wrap pendant, a Zen pendant with a Zen symbol, and a multi-wrap necklace that has several (fifteen) small to large wraps on its chain. 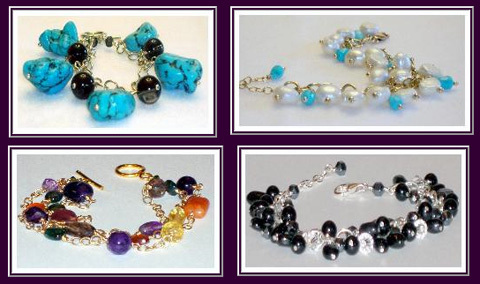 The bracelets are quite beautiful, so that you can make a set for ourself or a friend. Some have very brightly colored stones all the way around. Some use only one stone. There is a swirl bracelet that interlocks with each piece. The wrap bracelet will go nicely with its matching accessories. The sets made from these beautiful pieces of jewelry will be around for many years. All your friends will want a set after they see them all together. Michelle also has a tree collection that is quite gorgeous. The collection has a tree in a square or triangular shape. Some have diamonds with them as inlay. The set comes with a pendant, earrings, a ring, a bracelet, and a necklace. These come with 18-karat metal and will look great to wear with jeans or a night on the town. The bracelet is made from about seven to eight interlocking tree squares together. Rings are very beautiful here. They have an 18-karat gold ring that is like a woven basket. They also have a folded silver ring that includes a diamond. The tree rings are also here and come with or without a diamond. They also have a pink tourmaline stone set in a gold setting that is quite lovely.